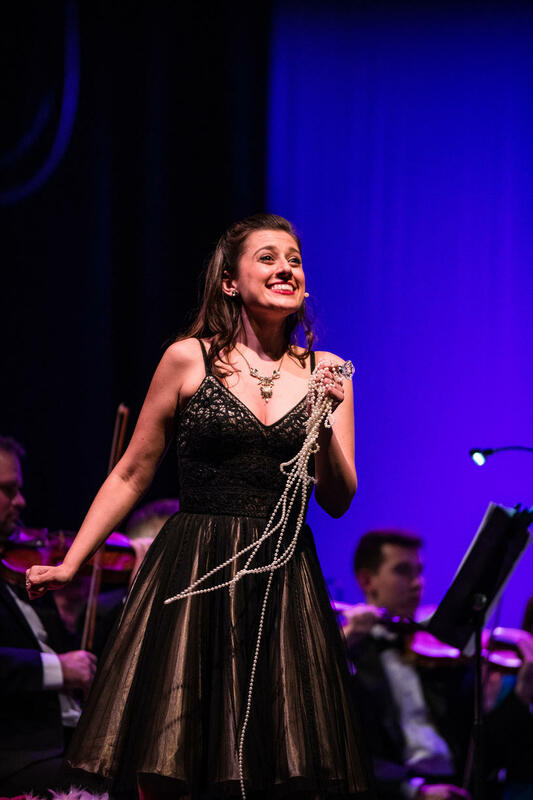 Soprano Megan Pachecano returned to South Texas for a concert with the Mid-Texas Symphony last fall. Pachecano returned to South Texas in October, 2018 for a program with the Mid-Texas Symphony, where she sang music by Maurice Ravel and Richard Strauss. The concert was conducted by Silas Nathaniel Huff, one of four candidates to replace David Mairs, the longtime music director of the orchestra who retired last year. By phone from a rest stop in Delaware (! ), Pachecano spoke to me about her early days in San Antonio, the need to be a versatile performer in today’s music world, and the excitement that comes with wearing Wonder Woman bracelets. Read an edited transcription of the conversation below, and hear Pachecano sing with the Mid-Texas Symphony on “Performance Saturday” this Saturday night, February 9, at 7 p.m. on KPAC 88.3 FM. Nathan Cone: Tell me about your early history here in San Antonio. Megan Pachecano: Well, I was born in San Antonio. I'm born and raised Texan. And I come by it honestly, because my mother's whole family is descended from the original Old Three Hundred that came to Texas with Stephen F. Austin, and then my dad's side of the family, he is Mexican American, so that's a whole other beautiful part of Texas culture, is our Chicano roots. So it's a fun mix of just really super Texan. Cool. So yeah, you absolutely have the two most important strains running through our state. Yeah absolutely. So I feel I feel lucky to get to represent a lot of different colors of Texas. Where'd you go to school here in town? Helena Symphony, Bernstein 100! Concert, as Cunegonde in Candide. Well, I went to Communication Arts High School [on the Taft High School campus], and I was part of the Taft choir through that magnet school. And then when I went to undergrad, I went to the University of Texas at Austin, before heading off for New York for grad school. [I had a ] very Texas education. And I benefited from Texas music education and I've seen now, like traveling over the United States, how wonderful the music education is in our state. We are coming up on the TMEA weekend here, of course, and that is amazing each year. That's right! I credit that whole All-State Region Choir, all that process was a really big part of my education. That was my first formal choral training was at Taft High School, but I was actually really lucky as a kid, I was in church choirs, and especially my time at Laurel Heights United Methodist, with Henry Holloway, was really the beginnings of my choral training, just not in a school setting, but that was a very serious part of music education in my past. And then getting to do TMEA at Taft was so awesome, and I met amazing people. And it's funny… another San Antonian, David Portillo, is the one that I got to work with at the Met this year. And he's the one I met TMEA All-State Choir in San Antonio! Are you the same age range? I think he's one or maybe two years older than me, but we were in that same group of Northside Independent School District choirs, and we all, I mean, all of our school programs had such fantastic teachers and opportunities. There’s a lot of San Antonians that I meet out there in the industry, like definitely Texans, but especially San Antonians in particular, so I'm really proud of that and we always find each other. I think Max Weir is, I know him from the Metropolitan Opera Chorus, and Tynan Davis. We find each other all over throughout the United States! Well that must've been magical to be at the Met and be with your fellow Texan, with David in "Fidelio." Oh, absolutely! And not only that, but the whole Met Opera chorus, the full-time chorus—I’m not part of the full-time, I just come in when they need extra people to sing in the big shows—but the full-time choristers have a lot of Texans actually, and a lot of people from UNT, for instance. And like I said, San Antonio, Austin… so it's fun to find each other, and you can tell by the longhorn shirts, or the cowboy boots, we find each other. We have our ways. The "y'alls!" Well you get back here to Texas it seems on a fairly regular basis. You were in San Antonio for the Mid-Texas Symphony that we're referring to and listening back on this program, as well as singing with the San Antonio Symphony last spring, I believe that was? Well it wasn't their formal programming, but I did get to sing in this Fiesta event. I got to sing at the coronation of the Order the Alamo. And that was at the Majestic, which was so special to me because growing up, I got to see all the touring Broadway shows at the Majestic, or symphony concerts. You know, Renee Fleming coming to town, things like that, and getting to actually be backstage and get to be performing in that event with musicians from the San Antonio Symphony was super special. And Austin Opera is somewhere that I got to work with in my undergrad in the chorus and this past season was also an opportunity for me to come back and sing with them in "Ariadne auf Naxos" as an actual principal character. So that was very special, too. So yeah, I do get back. I'd like to keep getting back more, you know? It's always great to just come back sing and where my family and friends and network are. Before we rolled tape, you were referencing the versatility that you have to have as a performer and singer nowadays. You've written about how singers and performers these days need to be versatile and do lots of different things. Could you expand a little bit about that, about how you can't just be a soprano so to speak, or just and operatic soprano? I had a really fun duet recital this year at Colorado State University, and we did master classes with the students. I shared some of this information with them, too, but I'm encouraging young people, young artists out there, to pursue all of their interests. And for me that includes orchestra pops, it includes Broadway. I just had a musical theater audition yesterday. Basically all the styles. Choral, I supplement my income with professional choral singing... oratorio... There's just all kinds of different music out there, and why limit yourself? I understand if you if you only feel passionate about one kind [of music]. By all means, pour yourself into that and be the best at that one thing. But if you have interest in multiple areas, and if you have it in your technique to be able to perform those different areas, it's really important to allow yourself, now without the stigmas that used to be in the industry, just allow yourself to pursue them and see what happens… I piece together all kinds of things, it's just part of that freelance gig economy that we're in right now. It's almost like we're going back to 1930s, ‘40s and ‘50s, in terms of being a performer and having to be, so the old saying goes, of being a “triple threat,” right? Where you have to be able to sing, dance, and you know, acting and all these things. So you've got to have a lot of stuff in your back pocket in order to present yourself, and be marketable. Yeah, absolutely. And they all inform each other. You know, I just recently did this whole really fun superhero rock band experience. And I got to belt, and I got to sing pop songs and rock songs and live in those shoes a little bit. For one thing that informs the character. I was playing a rock star, and have to go out there and be confident, even if that's not what I was trained in, I still have to … be convincing on stage. When I saw your photo of the Wonder Woman costume, I mean... that’s got to give you some sort of energy when you put on that outfit, too! Oh, yeah! I mean you get those wrist bracelets, you're good to go! That was one of my earliest costume memories for Halloween. My parents always made fabulous costumes for me growing up, and one of them was Wonder Woman one year, and my dad made these awesome bracelets out of cardboard and foil. And so that was really special. Finally, what's your dream role? What would you like to sing most? Well, I am a sucker for Mozart, Donizetti, those are my guys! I've gotten to do a lot of dream roles already, actually! Susanna in "La Nozze di Figaro," I've done Norina, Adina, two beloved heroines of Donizetti. I've never gotten to sing Musetta in "La Boheme." I love Puccini, I'm trying to explore more Puccini... I'm exploring more Bizet, I think Leila would be so fun, in "The Pearl Fishers." 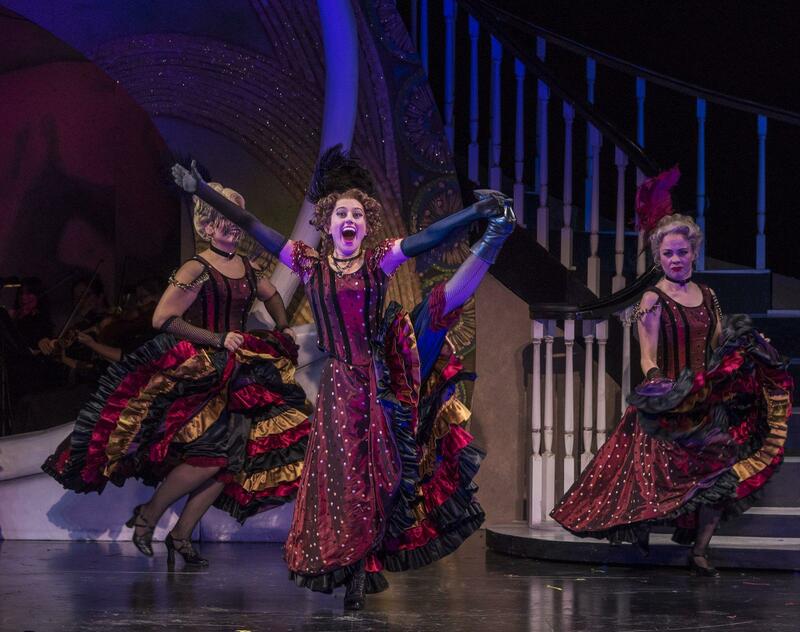 There's more lyrical things that I'm that I'm exploring, but I really love the comediennes. It's hard for me not to put on the acting chops and go out there and entertain, and I love the characters that allow me to have a little twinkle in my eye. But that's the thing about the business... there will always be variety. It's hard to just get pigeonholed into one thing, so I'll always have the opportunity explore the more lyrical, love-torn [roles], and sort of the fun, feisty ones too. Well Megan, thank you very much. Hear Megan Pachecano sing with the Mid-Texas Symphony on Saturday, February 9 at 7 p.m. on TPR's "Performance Saturday," heard on KPAC 88.3 FM. Pachecano sings with Opera Saratoga in June, 2018. The day after our phone call, she was headed back to New York for another audition. Clearly, a hard-working, talented performer on the move! After over two decades, David Mairs is stepping down from his role as Music Director of the Mid-Texas Symphony, a professional orchestra that plays in Seguin and New Braunfels. “I think that it's part of life,” he muses philosophically about the departure. Mairs had two tumors removed from his liver last fall, and a later scan discovered four more, for which he’s being treated. “Other than getting fatigued, I feel fine,” he says. Full interview with David Portillo. Tenor David Portillo has gone from the west side of San Antonio to the Metropolitan Opera, and returned home in late February for a recital at the Tuesday Musical Club, as well as workshops with area students. Nearly 200 people attended the 2 p.m. concert on Feb. 23 at Laurel Heights United Methodist Church, which included a healthy helping of Spanish-language favorites, as well as an aria from one of Portillo’s dream roles, Nemorino in The Elixir of Love.